The image that is attached has two parts. 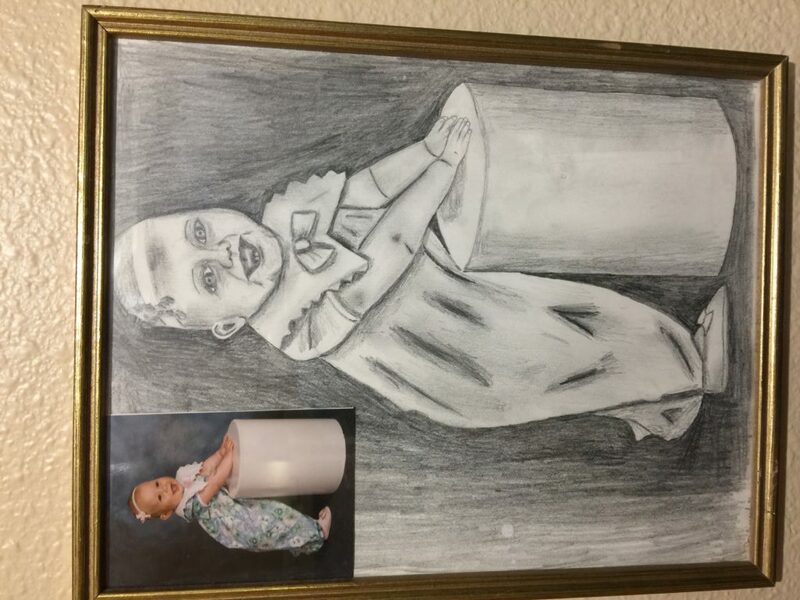 The first is a picture of my daughter as an infant and then an attempt of mine to draw the picture. My attempt to draw is not as good as the picture itself, but it was an attempt. God is the ultimate Creator. When He originally created mankind, He made us in His image. The problem is that we are prone to sin and the image we project is an imperfect image. We may strive to live in obedience to God and others, but so often we fail and fall short. The good news is that God in His love has sent us a Savior in Jesus Christ who came to this sinful world. He lived a life without sin perfectly reflecting what the image of God is meant to look like. He then made a difficult journey that led Him to a cross where he freely gave His life to be a perfect sacrifice for the sin of the world (including our sin). He then rose from the dead on that very first Easter to pave the way to heaven for us so that we can live forever in the presence of God. My friends that is what love looks like. Now through faith in Jesus, His perfection covers us over and the perfect image of God is placed over our lives. Now in this freedom we have in Christ, what are we going to do? Living in love for God and others would be the best use of this freedom. As a Pastoral Counselor and a Christian Coach that is the path I lead my clients on and the transformations I see in their lives is amazing. Have a blessed Easter Season!! This entry was posted in Uncategorized and tagged Easter, freedom, Image of God, Jesus, jonabjorgaard@gmail.com, jonbjorgaardaz.com, Love. Bookmark the permalink.